The unique, delicate rim of the Fido-Wht Freestanding Aquatex Bathtub is not only eye-catching, but it subtly lifts to cradle the bathers neck and head and provide ultimate comfort. The freestanding construction of this tub is perfectly complimented by the solid matte surface of the Aquatex material; the velvety texture of which is smooth and pleasant to the touch. This tub is extra deep, perfect for a full-body soak, and is designed to suit one or two bathers. 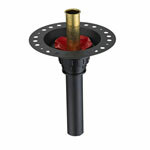 It also boasts a solid, one piece construction for safety and durability and a matching, white stone-coated drain. The Fido is cUPC Certified in the United States and Canada. Depth to Overflow Drain: 16.2 in. Interior Width (Top): 27.5 in. Interior Width (Bottom): 19.3 in. Note: The white and red models usually ships in 1-2 days. The black model usually ships in 3-4 weeks. Please allow an additional 2-3 business days for order transmittal and verification. Depth to Overflow Drain - 16.2"